I recently discovered that August is the optimal time to visit Balatonfüred Hungary as the village hosts "The Wine Weeks of Balatonfüred". This festival features wines and palinka (grape brandy) produced in the Balatonfüred-Csopak wine region. This is a historical tourist destination located in the northeast corner of Lake Balaton. 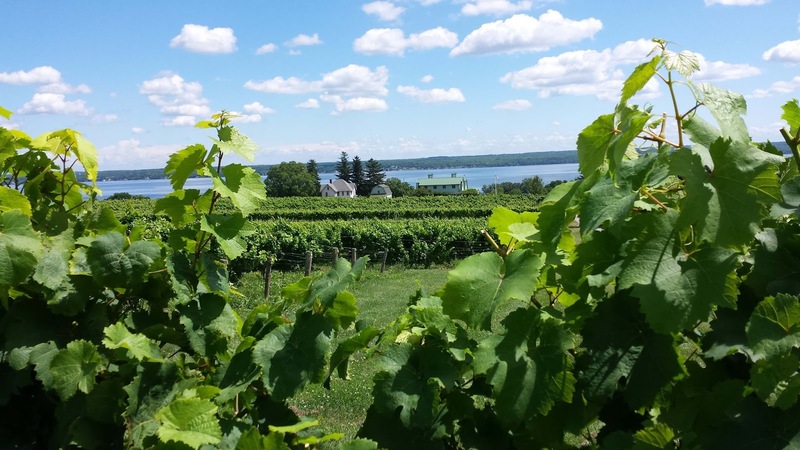 August is also an optimal time to visit New York's Finger Lakes as I did as a participant in the 2015 Wine Bloggers Conference. 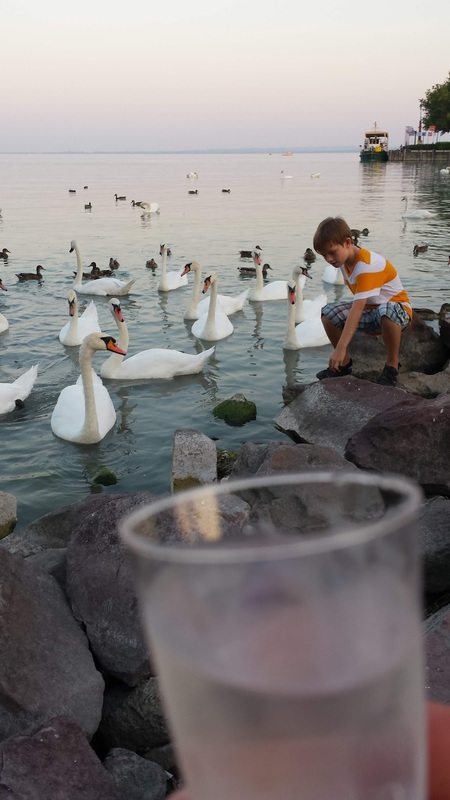 Visiting both regions a week apart highlighted the numerous similarities in viticulture between the Finger Lakes and Lake Balaton and specifically between Seneca Lake and Balatonfüred-Csopak. These similarities include the climate, soil, and grapes. Grape growing in both wine regions benefit from lake induced micro-climates. Lake Balaton is the largest lake in Central Europe whereas Seneca Lake is the largest and deepest of the Finger Lakes. Both lakes moderate severe winter temperatures and in some areas, vineyards located a mile from each lake are protected. Seneca Lakes provides more of this thermal retention as the lake never freezes, whereas Lake Balaton sports a thin layer of ice in winter - as it is much shallower. In summer, the lakes lengthen the diurnal temperature by acting as a mirror during the daytime and elevating the temperature and then absorbing the excess heat at night - preserves the balance of natural acids in the grape. 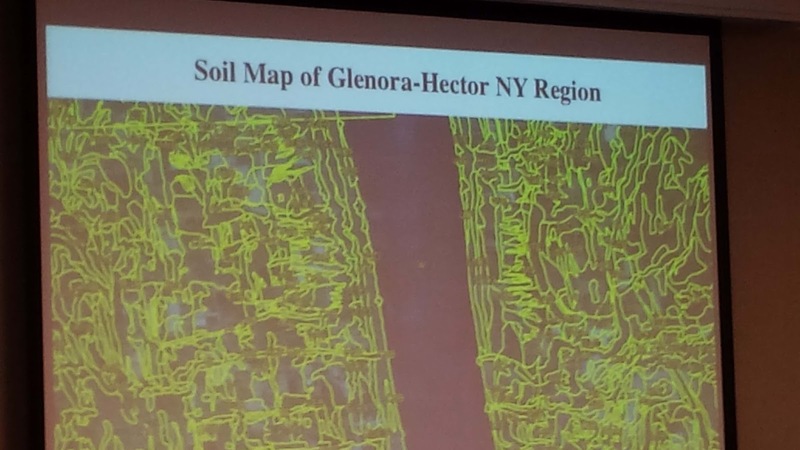 At various times during our WBC15 visit we learned how diverse the soils can be around Seneca Lake. This was first revealed during the pre-excursion to Fox Run Vineyards and enforced during a presentation at the conference. This slide to the left shows the diversity of soil types in just a small area on eastern Seneca Lake, plots of sand red clay, brown loam, shale, limestone, poor drainage and well drainage soils. And Fox Run has leveraged the different soil types into a Geology Series devoting two vineyards (Lake Dana Vineyard Block 11 and Hanging Delta Block 7) of Riesling in order to compare the interplay of terrior and wine making techniques. Soil diversity is also prevalent in Balatonfüred-Csopak as the soils is based upon volcanic shale, mingled with red sandstone, limestone, dolomite, and basalt. These conditions present a challenge for grape growers -- what to plant in each small plot. In some instances, the grapes planted in these soils are the same across both wine regions. An obvious similarity is Lemberger-Blaufrankish-Kékfrankos, the same grape known by different names. That the grape fares well in both regions wasn't surprising after I read Finger Lakes Wine and the Legacy of Dr. Konstantin Frank (American Palate) and A Sense of Place: A Discovery of Finger Lakes Wine History, and Villa Bellangelo Winery , ironically on the plane to Europe. Both books mention that the New York State Agricultural Experiment Station in Geneva had recommended planting vinifera grapes as far back as 1917, with one being the Hungarian variety Kadarka. This information was lost to the Finger Lakes until vinifera production was revived by Dr. Frank in the 1970s. Whereas Lemberger is a minor player in the Finger Lakes, it is the primary red grape in Balatonfüred-Csopak. 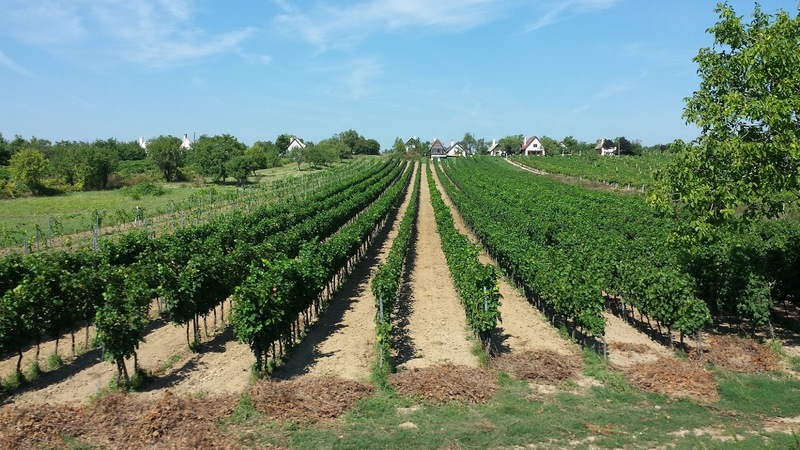 Other red varieties such as Bordeaux grapes and Pinot Noir do have roles in both regions, although in Hungary only in the Tihany Peninsula just west of Balatonfüred. As for white grapes there is a preponderance of cold climate Riesling varieties, just not the same Riesling variety. The signature grape for the Finger Lakes is Rhine Riesling whereas in the Balaton it is Olaszrizling (Welschriesling) - no relation between the two. In fact the origination of Welschriesling is still being debated - although it is extremely popular in central Europe - including Slovenia and Croatia. 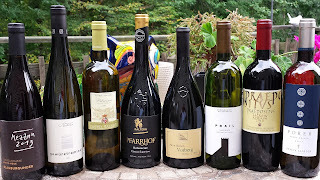 In both the Finger Lakes and Balatonfüred-Csopak, the Riesling grapes come in a range of styles from dry to semi-dry with plenty of acids to balance the sugar. Gewurztraminer (Tramini) is another common grape as well as Pinot Gris - although the Hungarian Szürkebarát version is more plentiful. Balatonfüred-Csopakis also home to several obscure indigenous grapes that I recommend sampling whenever possible: Juhfark (“Sheep’s Tail”), Leanyka (“Maiden”), Kiralyleanyka (“Princess”), and Zenit a rare modern day cross of the local Ezerjo variety, with the Slovenian Bouvier grape.Some of these are available at Ferenc Csarda in Tihany and in Balatonfüred at the Figula Borbár. 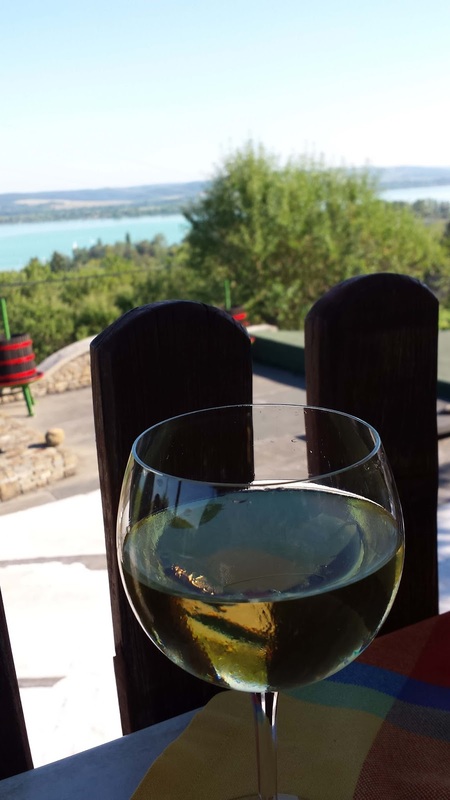 The main difference between the two regions - particularly during the "Wine Weeks of Balatonfüred" - is the ease of consumption in the village. 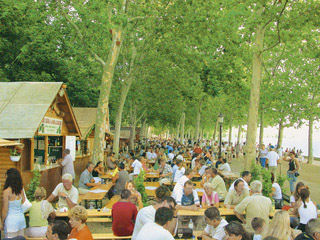 Kiosks were aligned along the main pedestrian path and revelers were able to walk along Lake Balaton sipping their wine. No open container or drinking in public laws in Hungary. Would be nice if this policy immigrated to the States. Regardless, cheers to both wine regions. Last week seemed like a good time to clean out the beer refrigerator as some of the bottles were starting to collect dust. 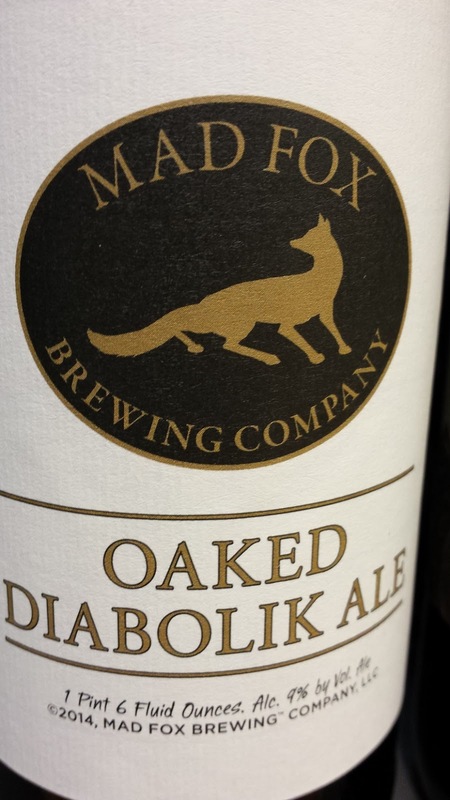 I started this cleansing with the Mad Fox Brewing Company Oaked Diabolic Ale, my favorite beer from the Virginia brewery. 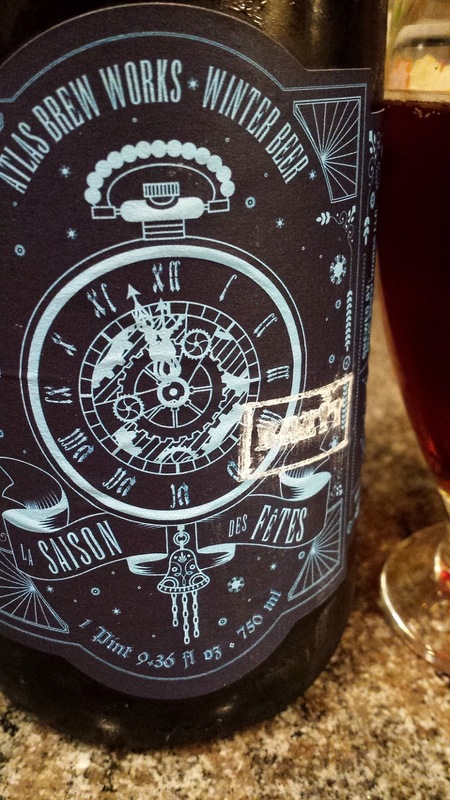 It is a Belgium strong ale, fermented with native yeast and aged in used oak barrels. And some strain of bacteria makes its presence known with the tart and funky flavors. There's also a creamy texture more associated with wine than beer. Limited qualities are popping up at my local Wholefoods. Last Spring I visited Atlas Brew Works and fell in love with their Town and Country Belgium Dark Strong Ale and the La Saison des Fêtes Farmhouse Ale. The former was received quite nicely at #WBC15 with it's wine like characters. On the other hand, the later is all sour - tart and funky with subtle spice. I'll be headed back to the brewery when the nice iteration of brewing commences for this seasonal. 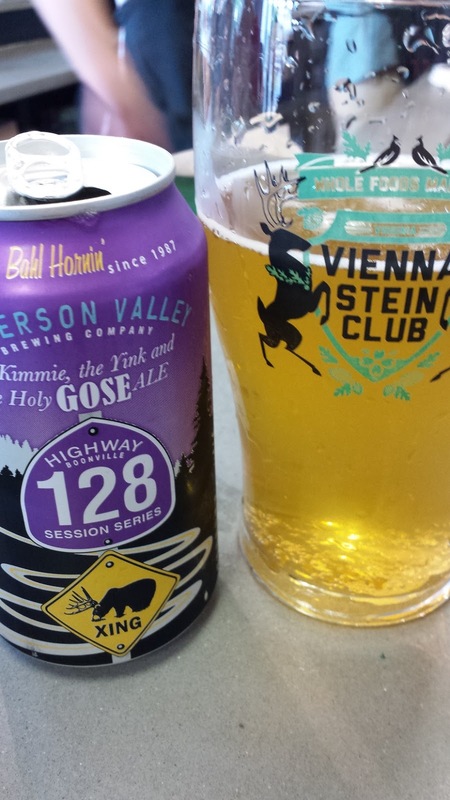 I usually have an Anderson Valley Brewing Company Gose readily available, either their The Kimmie, The Yink, & The Holy Gose or the Blood Orange Gose. The later is my all-time favorite in this style where the addition of blood oranges during fermentation leads to a delicious combination of citrus, salt, and tartness. The wort for both beers are soured with lactobacillus and salt added post fermentation. The Holy Gose is more readily available and more lemon flavor, effervescent and just as refreshing. 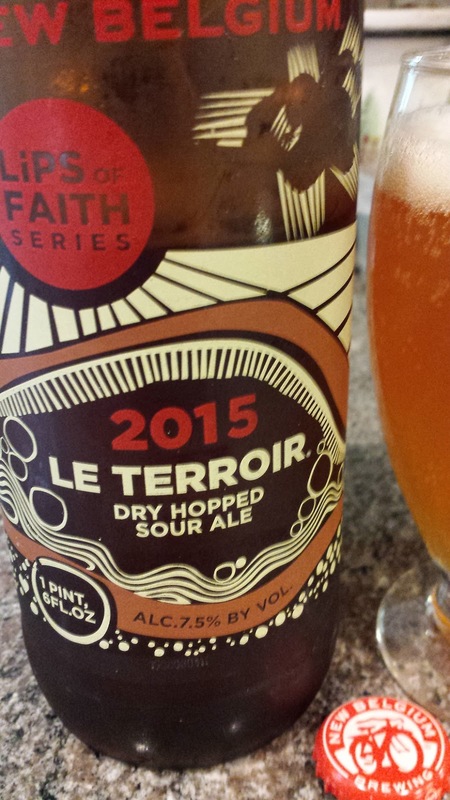 I've been following the New Belgium Brewing Company Le Terrior series and finally got around to buying their 2015 Le Terroir Dry Hopped Sour Ale. The base Le Terrior beer is aged three years in larger wooden foeders with this version dry hopped with Amarillo and Galaxy. The beer starts out full of flavor with subtle tartness and at this point is delicious. However, when the hops enter the palate during the tail, they detract from the savory flavors. Finally, I stopped by Caboose Brewing Company after a lunchtime bike ride and was excited to see their The Zoo Berliner Weisse still available. Can you see the sour inclination? Perfect for a post ride refreshment. They were also pouring a very nice Chocolaty Brown Ale on cask, which is their traditional brown ale brewed with chocolate bits. Getting close to Porter territory; it was medium bodied and very smooth. A family wedding lead me to Wilmington North Carolina where I found a thriving beer culture. Not only were their several excellent beer bars, a local bookstore (Old Books on Front St.) served beer, wine, and mead. 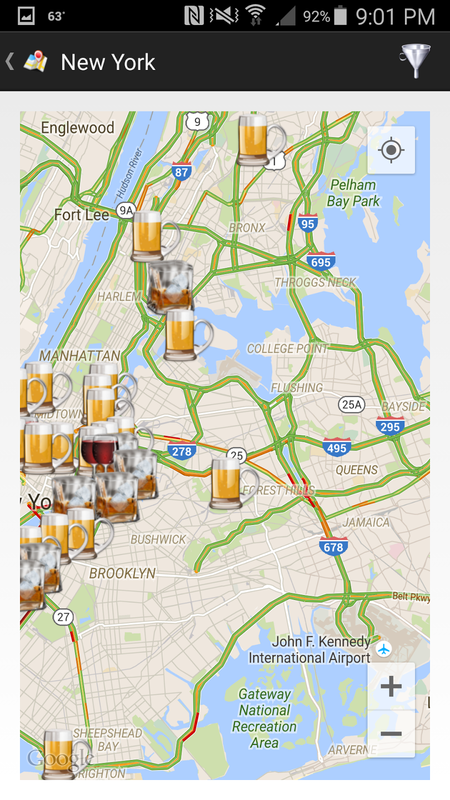 And this port city is home to several breweries, most of which I was able to visit or at a minimum sample a beer. 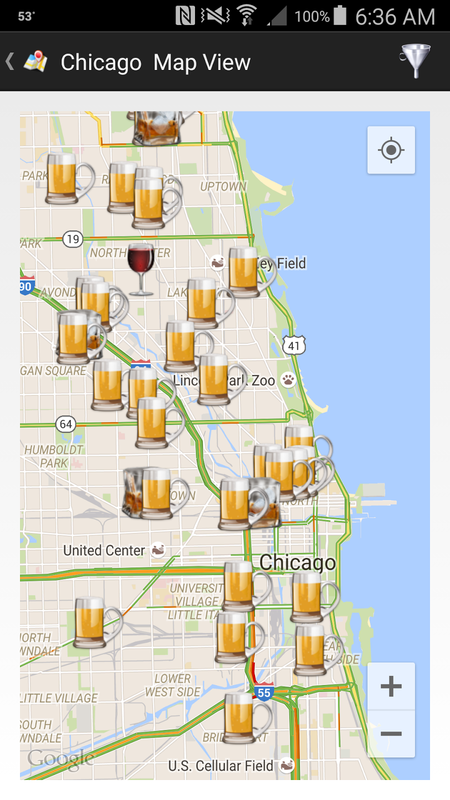 Regrets to BroomTail Craft Brews as the one brewery I completely missed. 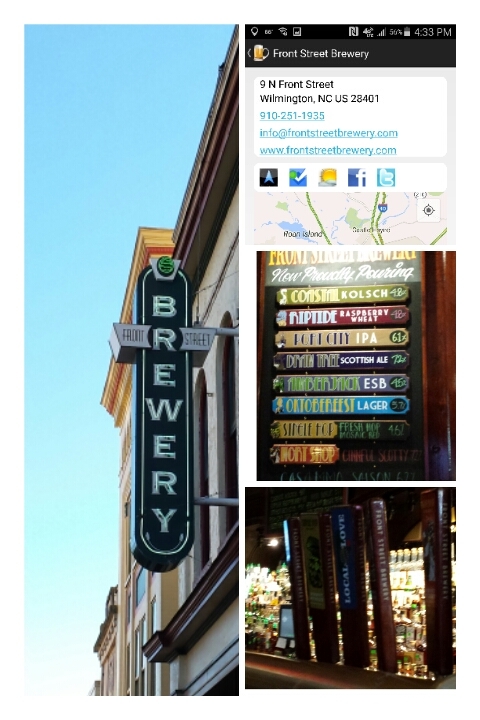 We started the weekend with lunch at Front Street Brewery, a brewpub located in a 1865 era building and serving microbrews and southern styled pub food . And don't leave without trying the 'Beers'wick Stew or Low Country Grit Cakes. 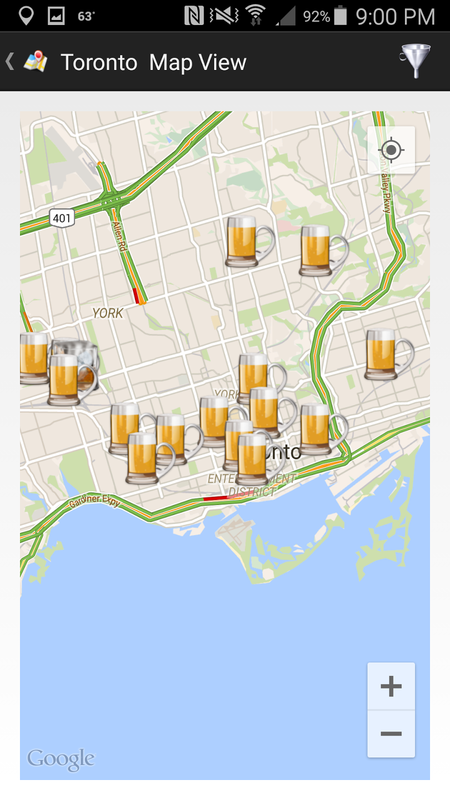 Front Street is also the Granddaddy of the local beer movement having opened a decade ago. Year round they provide eight beers on tap, augmented by a couple seasonals. I thought the Coastal Kolsch was spot on with the Dram Tree Scottish Ale a decent wee heavy, although a bit on the sweeter side. The brewery also houses the largest whiskey selection I've ever seen, 300+, that made my eyes water in temptation. Wow. 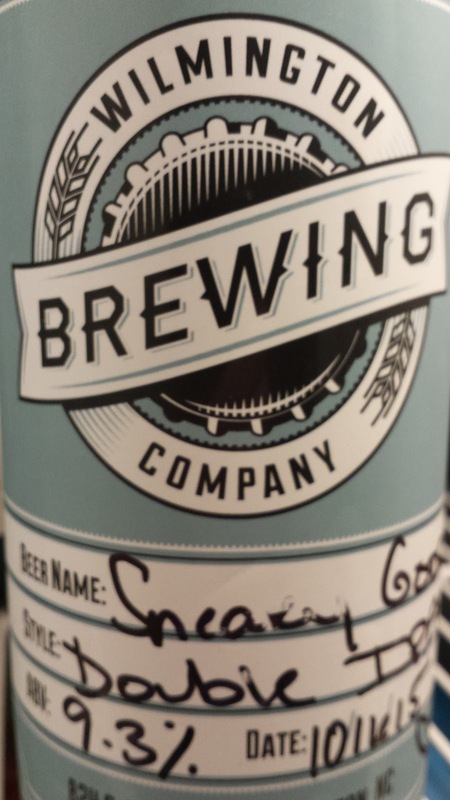 The bride and groom judiciously provided guests with a goody bag when checking into their hotel room and each bag contained a crowler of Wilmington Brewing Company Sneaky Goose Double IPA. Yes a crowler -- a 32 ounce canned container. Once the city's premier brewing supply store, the operation now includes a 3bbl brewery and tasting room. And good beer if the Sneaky Goose is any indication as it was heavy, but with a smooth backbone and plenty of aromatics. 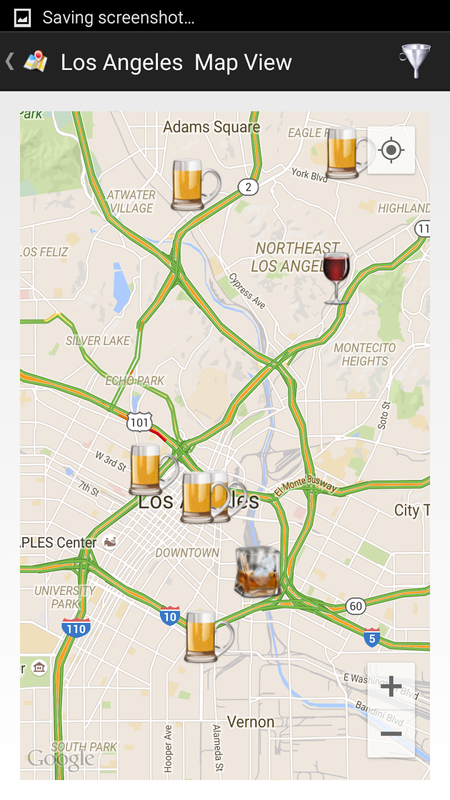 The brewery also offers a Kolsch, Stout, Saison, and Porter -- next trip. 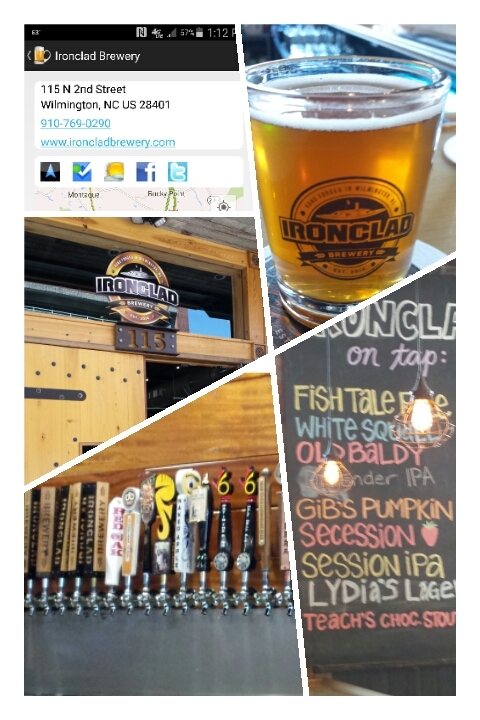 Before the ceremony a few of us ventured a couple blocks to Ironclad Brewery, a newcomer that specializes in home grown beer and live music. I tasted over half their menu and all were solid representatives of their respective styles starting with the Teach's Chocolate Stout. Plenty of smooth chocolate in this one. Two other smooth beers were their two lighter options Lydia's Lager (Munich Helles Lager) and the Old Baldy Golden Ale. And the Fish Tale Pale Ale was rather tasty as it had plenty of citrus in the tail. Wish we had more time to hangout. It's not a beer trip unless we visit an aquarium or zoo and fortunately for the little one, there's one of each in the beaches south of Wilmington. 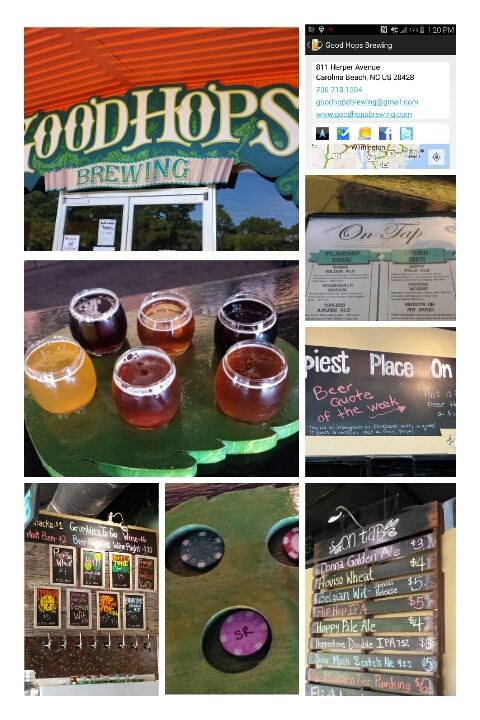 And along the route theCompass alerted us to Good Hops Brewing in Carolina Beach. The brewery is the companion to Lookout Brewing Company in Black Mountain and brews daily on a 3 barrel system and provide a wide range of ales. A seasonal Saison and the Donna Golden Ale were nice starts to the session, but the clear favorites were the Flip Hop IPA and Bravehop Scotch Ale. The former is a clean IPA, big but refreshing on the palate. 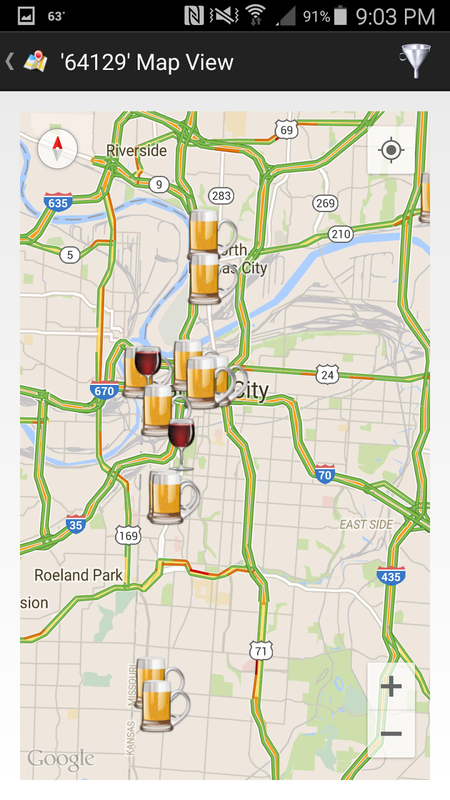 The later is currently a sour that requires a few sips to penetrate into the wee heavy flavors. A fantastic beer. 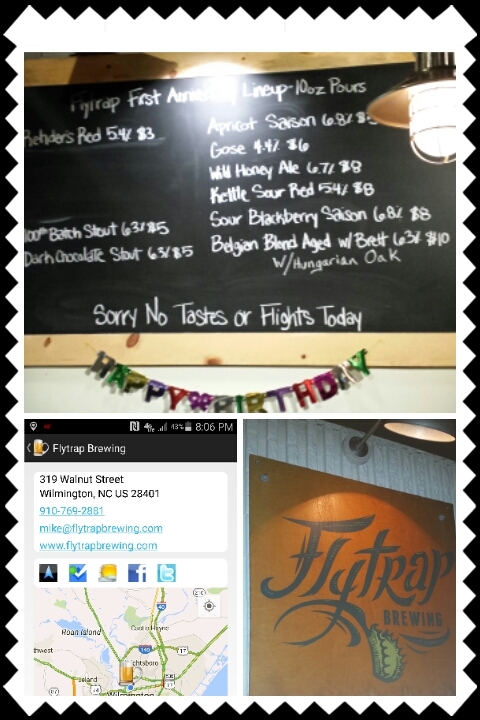 The final stop during the weekend was to the First Anniversary Party at Flytrap Brewing. And not just any party, a sour beer party. The lineup was stellar, unfortunately no samples so I stuck with the Gose and Belgium Blonde aged in Hungarian Oak. The Gose was very unique, stone fruits up front and slightly tart and salty on the back end. The oak aged Belgium was phenomenal; some funk and brett finishing slightly sour. Well worth the high price tag. The brewery was rocking that night with a large crowd and live music. Seems like an appropriate metaphor to the overall Wilmington craft beer scene. Cheers. The road to Wilmington, North Carolina runs through Muscadine (Vitis rotundifolia) wine country and adjacent to the world's largest muscadine producer: Duplin Winery. 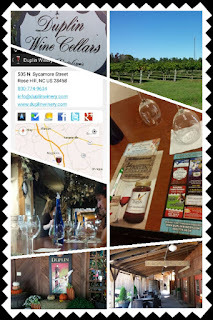 I've always wanted to visit the winery after seeing their lighthouse themed labels in the Outer Banks and learning about Muscadine in the early days of WineCompass.com. Last week I finally had an opportunity during a trip to Wilmington and stopped into their popular Rose Hill tasting room. The winery traces its inception to the early 1970s when D.J. Fussell, Sr. and his two sons, David and Dan planted muscadine to meet a strong demand for those grapes. When the wholesale market collapsed they started Duplin Winery becoming the first post-prohibition winery in the south. The winery grew rapidly until the 1980s when government regulations virtually strangled the winery and David Fussell Sr. almost closed the operation. The family persisted and today a third generation of Fussells manage not only the oldest, but also the the largest winery in the south. 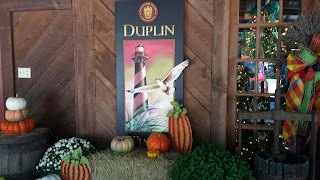 Duplin Winery grows and sources mostly muscadine grapes, although a few labrusca grapes such as Niagara and Catawba are included in some blends. Carlos, Scuppernong, and Magnolia are the primary white muscadine varieties with Noble, James, and Coastal James the major red players. Their wines are obviously grapey and mostly sweet, with the driest being the Carlos and Burgundy. Regardless of the sugar level, all the wines I tasted had generous amounts of acids to help balance the sugar. In fact the sweeter Scuppernong was my favorite of the group for that very reason. Duplin also produces a limited release Mother Vine Scuppernong from clippings from the 400 year old Mother Vine, acquired when the winery helped save the historic vine. As for the reds, the semi-sweet Goin' Coastal blush wine was my favorite red as the grapey character is muted in exchange for a more citrus flavor. There is no charge for the tasting of twelve wines and if you find one to purchase, the retail price will most likely range from $7 to $15. Definitely priced to experiment. Cheers to Muscadine, the Mother Vine, and Duplin Winery. With the 2015 Major League Baseball wildcard games over, baseball fans will be traveling to their favorite team's stadium or, if ambitious, to an away outing for the remainder of the playoffs. Most fans will be content to chug mass produced lagers, but there must be a few among you who desire a richer beer experience. 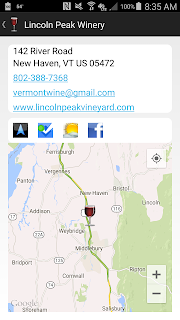 That's where theCompass Winery, Brewery, Distillery Locator Mobile App comes into play. 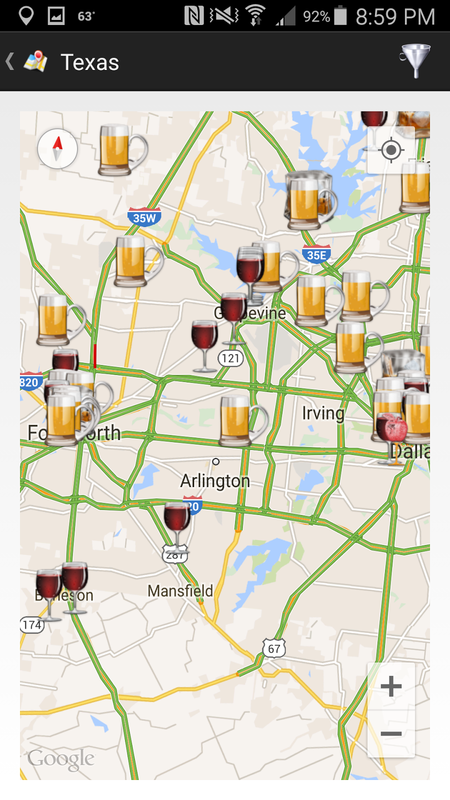 This application will help you find breweries, distilleries, and perhaps a winery near your destination. 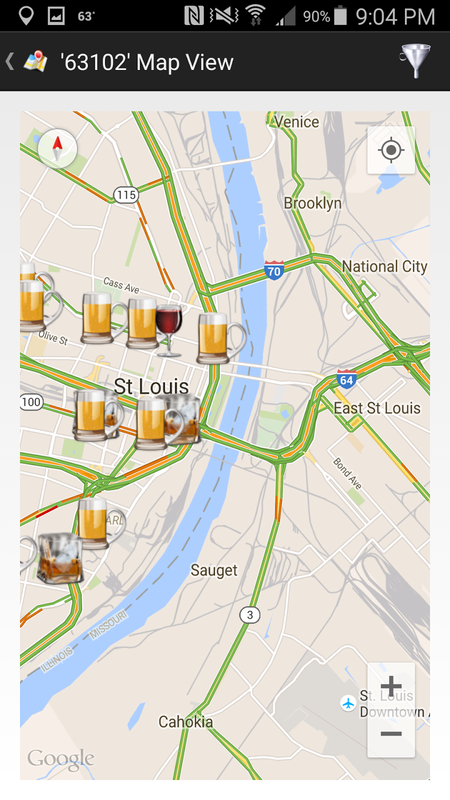 And for cities such as Kansas City and St. Louis, where the baseball stadiums are situated near two states, theCompass location and zip code search will find establishments across state boundaries. Below are screenshots for each city, but I've also included a few suggestions near each stadium or in specific districts. 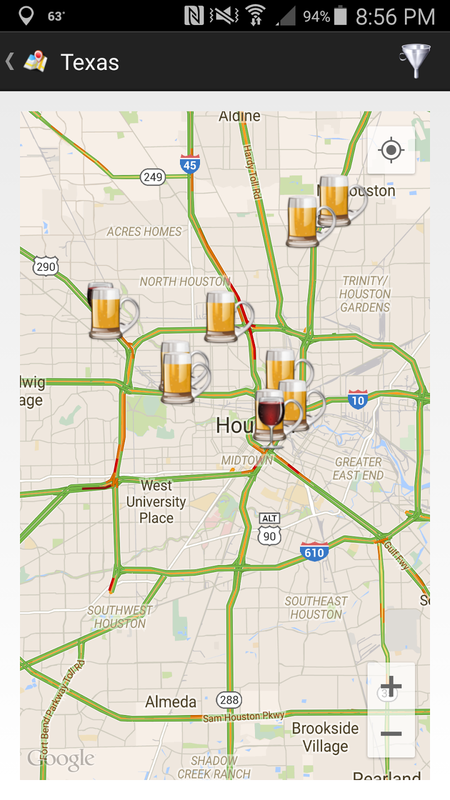 Cheers and safe travels. 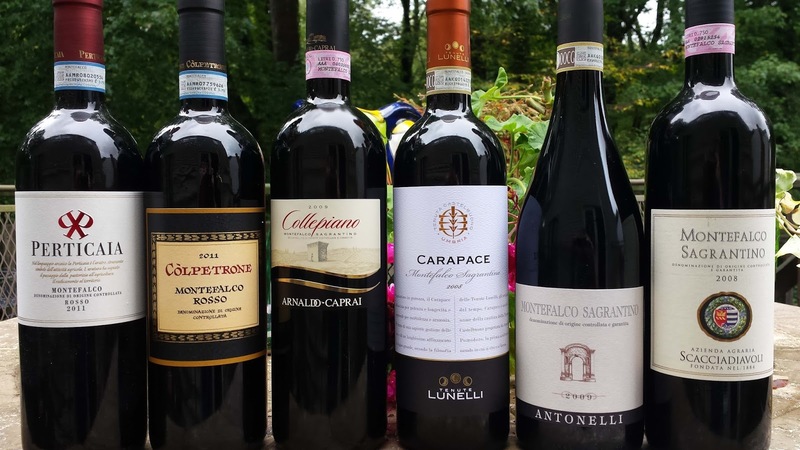 Last week presented another opportunity to taste several wines from Italy's Montefalco during a #SipMontefalco virtual tasting. I had previous written about this region under From St. Francis to DOGC: Umbria's Sagrantino di Montefalco, which describes the history and DOC & DOCG designations. During this tasting, participants sampled DOC Montefalco Rosso and DOCG Sagrantino di Montefalco. At the same time, representatives of the respective wineries joined as online from the Montefalco Town Hall. Filippo Bartolotta moderated the tasting, guiding us through the wines, wine-making techniques, and questions. One shared character is that all the wines developed wonderfully the second, third, and even fourth days after opening.To learn more about the wines and region visit the Montefalco Wine Consortium. Perticaia Montefalco Rosso DOC 2011 ($28, 12% ABV) - Sangiovese 70%; Sagrantino 15%; Colorino 15%. Aged 18 months with 12 months in stainless steel and 6 months in the bottle. The Colorino adds color and structure. Descriptor: dark red fruit, texture throughout, a little dirt, and chewy leather tannins. Colpetrone Montefalco Rosso DOC 2011 ($19, 14% ABV) - Sangiovese 70%; Sagrantino 15%; Merlot 15% from Marcellano (Gualdo Cattaneo). 60 % of the wine is aged in stainless steel; the other 40% is aged 12 months in French oak tonneaux and barrique. Descriptor: the fruit and earth blend seamlessly; smoother tannins. Tenuta Castelbuono 'Carapace' Montefalco Sagrantino DOCG ($37, 15% ABV) - Sagrantino 100% from estate vineyards in Montefalco and Bevagne. Aged 24 months in large oak casks, followed by minimum 12 months in the bottle. Descriptor: complex nose of black fruit and mint; smooth body - heavy tannins. Antonelli Sagrantino di Montefalco DOCG 2009 ($45, 14% ABV) - Sagrantino 100% various oak and cement treatment, then bottle aged for 12 months. 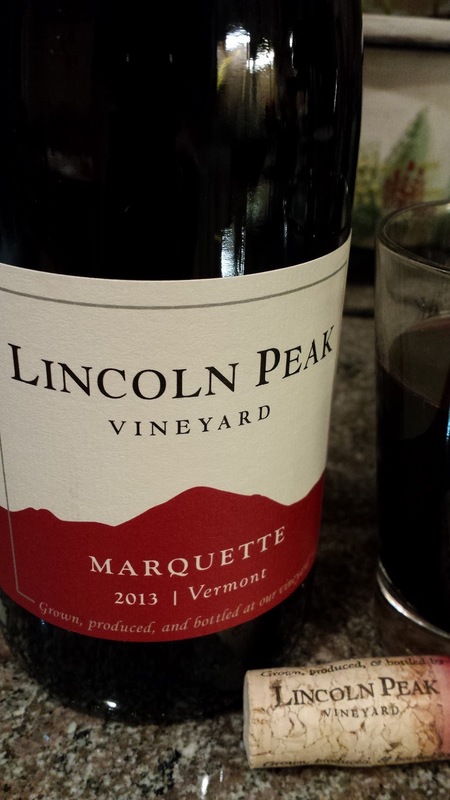 Descriptor: another with mint on the nose; dried fruit flavor; very firm tannins with long finish. Arnaldo Caprai 'Collepiano' Montefalco Sagrantino DOCG ($60, 14.5% ABV) - Sagrantino 100% aged 22 months in French oak barrique and minimum 6 months in the bottle. Descriptor: jammy blackberry palate; then finishes with huge tannins.